"AMERICANS ASKS VLADIMIR PUTIN TO SEND TROOPS." KIEV, Ukraine — Russian media has been unable to contain its glee at the news that fresh riots have broken out in Ferguson: America is gripped in the throes of a violent race war as retribution for the bloody revolution it had plotted against Moscow's allies in Ukraine, according to the pro-Kremlin press. "The conflict in Ferguson isn't a one-time event, but something profound," Russian state television anchor Alexander Khristenko said on the Rossiya channel. "Race relations, social inequality, a black ghetto — the fragile world that hardly held itself together through a belief in just a little bit of fairness, it seems, has finally collapsed." Russian media, which usually prioritize coverage of Vladimir Putin's every move and the Ukraine crisis ahead of more distant international events, have run wall-to-wall bulletins on the violence in Ferguson since it began in August. Coverage of the fresh rioting led every pro-Kremlin newscast on Tuesday. Russia Today, the Kremlin's English-language propaganda channel, broadcast live from the scene. For the Kremlin, the upheaval in the U.S. is a chance to score points against the White House for its support of the pro-Western Maidan protests that began in Ukraine a year ago and precipitated the biggest crisis in East-West relations since the Cold War. Sergei Naryshkin, speaker of Russia's parliament and a close Russian ally, hinted on Tuesday that the rioting was America's just desserts for "plunging the world into the chaos of its one-sided diktat," the Itar-TASS news agency reported. Vladimir Vasiliev, a political scientist interviewed as an expert on the U.S. by the pro-Kremlin TV channel LifeNews, went one further. "It's the combination of a number of factors: the Americans have overdone it with Ukraine recently, and Maidan has come to the U.S.," he said. RIA Novosti, Russia's Kremlin's state newswire, referred to the Missouri National Guard with the same abbreviation it uses for Ukraine's national guard, which has become a favorite Kremlin bugbear for the prominent far-right fighters in its ranks. Russia's schadenfreude over Ferguson shouldn't be confused with opposition to police brutality — something which the Kremlin has actively supported, both at home and abroad. Officers of Russia, a pro-Putin association of current and former military and police officers, actually said last month that it was "now actively studying the experience of racial disorders in Ferguson" to get ideas for if, as many predict, racial violence involving Russia's rapidly growing Muslim population breaks out. 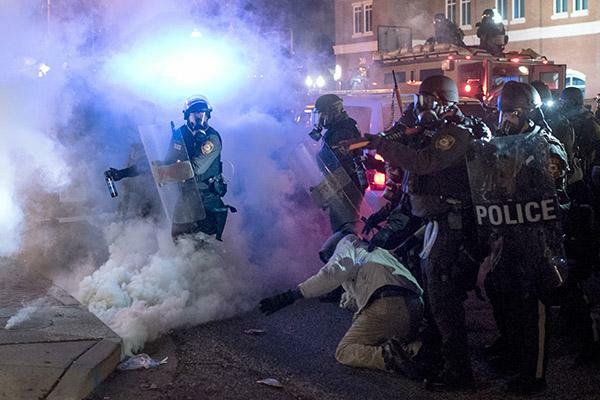 Rather, Ferguson gives Russia the perfect stick to poke in America's eye. Since the Cold War, Moscow has engaged in a political points-scoring exercise known as "whataboutism" used to shut down criticism of Russia's own rights record by pointing out abuses elsewhere. All criticism of Russia is invalid, the idea goes, because problems exist in other countries too. When Putin speaks out in favor of human rights, it's not because he supports them, but because he believes that Western principles and institutions are empty, inherently valueless concepts used to callously advance U.S. interests at Moscow's expense. The race card, a favorite tactic of Cold War whataboutists, has played prominently in Russia's Ferguson coverage. State TV largely ignores the myriad other attendant issues to paint it as a race war between rich whites and poor blacks, often referred to as "negroes." Usually, this degenerates into ill-judged racist jokes and a childish giggling at the fact that black people exist. Lenta.ru, a pro-Kremlin website, called the riots a "colored revolution" — a reference to the "color revolutions" that rattled the Kremlin a decade ago when they overthrew pro-Russian presidents in three post-Soviet states, including Ukraine. Anton Korobkov-Zemlyansky, a prominent pro-Kremlin blogger, referred to the cities where protests broke out as "Black Russia" and tweeted the hashtag #Afromaidan, a nod to Kiev's Euromaidan. There were also lots of jokes comparing events in Ferguson to the unrest in eastern Ukraine. "Ferguson self-defense forces have spontaneously appeared and are ready to defend its restless citizens against the repressions of the Washington junta!" joked nationalist blogger Egor Prosvirnin. &#x421;&#x442;&#x438;&#x445;&#x438;&#x439;&#x43D;&#x43E; &#x432;&#x43E;&#x437;&#x43D;&#x438;&#x43A;&#x448;&#x430;&#x44F; &#x441;&#x430;&#x43C;&#x43E;&#x43E;&#x431;&#x43E;&#x440;&#x43E;&#x43D;&#x430; &#x424;&#x435;&#x440;&#x433;&#x44E;&#x441;&#x441;&#x43E;&#x43D;&#x430; &#x433;&#x43E;&#x442;&#x43E;&#x432;&#x430; &#x437;&#x430;&#x449;&#x438;&#x442;&#x438;&#x442;&#x44C; &#x432;&#x43E;&#x441;&#x441;&#x442;&#x430;&#x432;&#x448;&#x438;&#x445; &#x436;&#x438;&#x442;&#x435;&#x43B;&#x435;&#x439; &#x433;&#x43E;&#x440;&#x43E;&#x434;&#x430; &#x43E;&#x442; &#x440;&#x435;&#x43F;&#x440;&#x435;&#x441;&#x441;&#x438;&#x439; &#x432;&#x430;&#x448;&#x438;&#x43D;&#x433;&#x442;&#x43E;&#x43D;&#x441;&#x43A;&#x43E;&#x439; &#x445;&#x443;&#x43D;&#x442;&#x44B;! Стихийно возникшая самооборона Фергюссона готова защитить восставших жителей города от репрессий вашингтонской хунты! "Representatives of the Missuriisk Cossack Horde have come to Ferguson to support the uprising." There were also nods to Russia's annexation of Crimea, which it passed off at the time as a local uprising. "There's no Russian army it's just the local militia," this soldier says in front of a sign reading "Washington People's Republic." Other bloggers made fun of a notorious moment when a top U.S. official handed out cookies to protesters in Kiev, much to the Kremlin's chagrin. 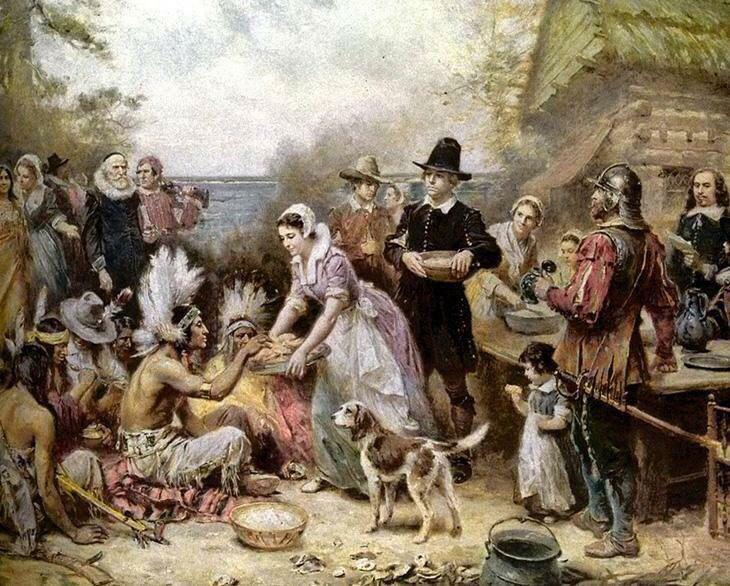 This Thanksgiving picture is captioned "Handing out cookies to supporters of European values." &#x420;&#x430;&#x437;&#x434;&#x430;&#x447;&#x430; &#x43F;&#x435;&#x447;&#x435;&#x43D;&#x435;&#x43A; &#x441;&#x442;&#x43E;&#x440;&#x43E;&#x43D;&#x43D;&#x438;&#x43A;&#x430;&#x43C; &#x435;&#x432;&#x440;&#x43E;&#x43F;&#x435;&#x439;&#x441;&#x43A;&#x438;&#x445; &#x446;&#x435;&#x43D;&#x43D;&#x43E;&#x441;&#x442;&#x435;&#x439;. Раздача печенек сторонникам европейских ценностей. Igor Korotchenko, a shrill pro-Kremlin defense analyst, didn't see the funny side. If protests against Putin two years ago had been like that, he wrote, "they would have declared Russia the Evil Empire. But in America it's called democracy." Neither did some Ukrainian tweeters. "Never compare Ferguson and Maidan," the Euromaidan account wrote. 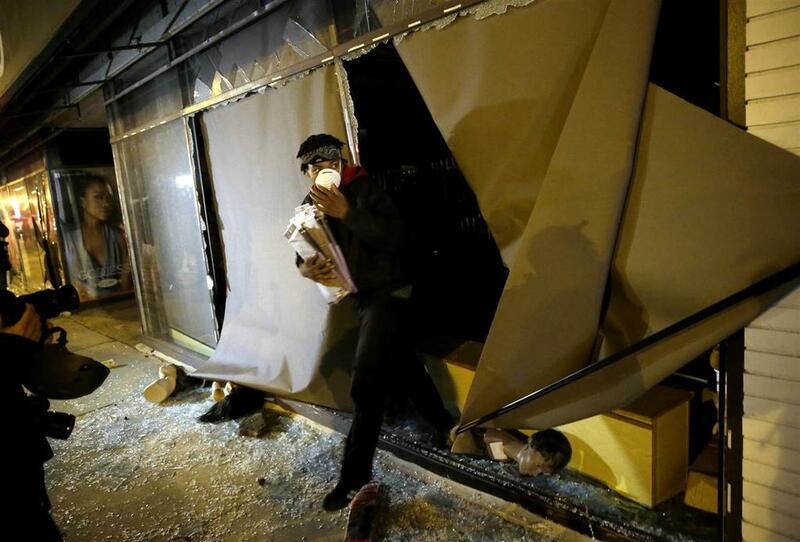 "Nobody looted stores on Maidan." &#x41D;&#x438;&#x43A;&#x43E;&#x433;&#x434;&#x430; &#x43D;&#x435; &#x441;&#x440;&#x430;&#x432;&#x43D;&#x438;&#x432;&#x430;&#x439;&#x442;&#x435; &#x424;&#x435;&#x440;&#x433;&#x44E;&#x441;&#x43E;&#x43D; &#x438; &#x41C;&#x430;&#x439;&#x434;&#x430;&#x43D;. &#x41D;&#x430; &#x41C;&#x430;&#x439;&#x434;&#x430;&#x43D;&#x435; &#x43D;&#x438;&#x43A;&#x442;&#x43E; &#x43D;&#x435; &#x433;&#x440;&#x430;&#x431;&#x438;&#x43B; &#x43C;&#x430;&#x433;&#x430;&#x437;&#x438;&#x43D;&#x44B;. Никогда не сравнивайте Фергюсон и Майдан. На Майдане никто не грабил магазины.